Dan Fernandez knew there was always going to be a need for someone like him, he told The Los Angeles Times in 1992. Someone like him was a backup catcher, he told The Times, somebody that wasn't going to complain. "I think I can play in the big leagues," Fernandez told The Times that August, in his fifth pro season. "I realize I've never really done anything to show that I can, but then, I've never really had the chance to play every day." Fernandez never did get that chance to be a starter. In a career that spanned a decade, he also never got to play in the majors. Fernandez' pro career began in 1988, signed by the Giants as an undrafted free agent out of Cal State Northridge. At Northridge, Fernandez caught the eye of a Giants scout, even though never starting there, or at his previous school Chabot. He hoped that would change as a pro. "When I came out of high school, I wasn't ready to be anyone's sub," Fernandez told The Times in February 1988. "It ate me up every day. But I went out of my way both at Chabot and at Northridge to help out the team any way I could, to give the appearance that I wasn't unhappy." 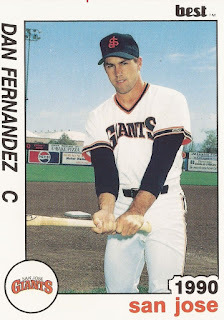 With the Giants, Fernandez played that first season at single-A Clinton, getting into just 23 games and hitting .226. He played 1990 and 1991 both at single-A San Jose, getting into 50 games his first year there and 36 his second. Through is first five professional seasons, Fernandez never got into more than 60 games in one season. He got his first look at AA Shreveport, a seven-game stint, in 1991. He returned there for 60 games in 1992, hitting .216. Fernandez then got into 90 games in 1993, splitting time between Shreveport and AAA Phoenix. In 1994, he returned to Phoenix, but got into just 44 games. His average in those 44 games in 1994, though, was .273. To The Times that August, Fernandez attributed the increased average to figuring things out, despite his lack of playing time. "Here I am, in my seventh year," Fernandez told The Times, "and I'm just now experiencing some success at this stuff. There's no substitute for actually doing it." In 1995, Fernandez moved to the Tigers system, playing at AA Jacksonville. He got into 94 games, the most he'd ever get in a pro season. But his affiliated career was over. Fernandez played one more season with independent Canton in 1997, ending his career for good.